Want to sell your shoes & accessories online? 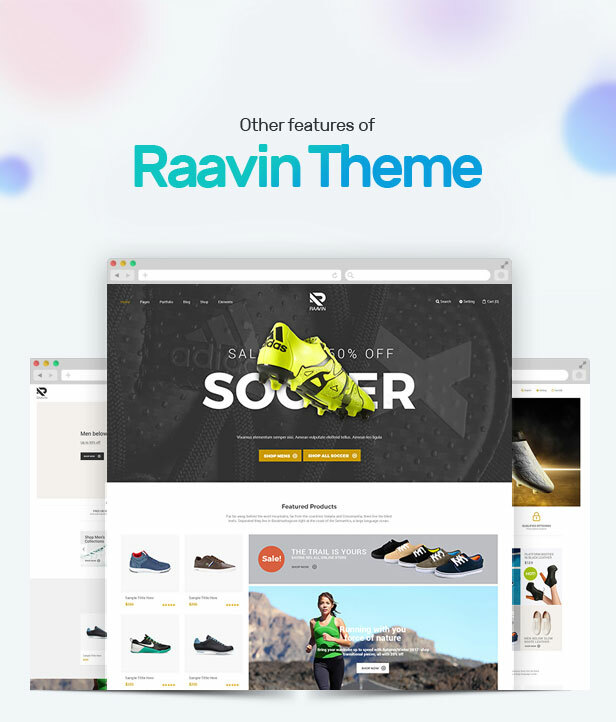 Raavin Responsive Opencart theme looks really cheerful, welcoming each visitor to order something from you. 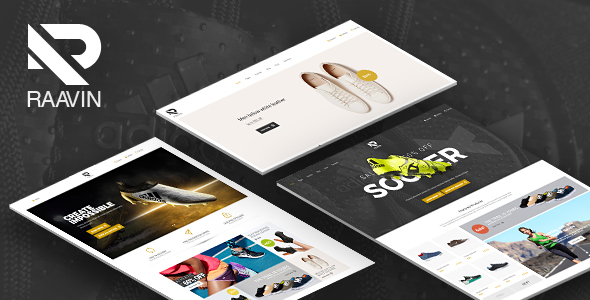 This theme will be a great solution for online Shoes Shop, Fashion Store, Accessories Store. This layout is bright with 3 flexible homepage layouts which makes a proper effect on customer. Raavin Opencart theme includes many functional features such as Product Quick View, Product zoom image, Ajax Add to cart, compare, wishlist that will help you improve your sales. Megamenu [Drag & Drop builder] comes with an user-friendly interface through which you can create powerful menu. It allow you to insert any content with images, text, videos, easy to config through admin. When customers enter your site, the first thing they’ll see is a large slideshow with nice images and smooth text transition. Besides, Raavin also contains products slider to put new products, featured products, best selling products, sale products in suitable locations. Tab Products module sort types of products : new, bestsellers and discount in each tab . Blog and Testimonial help to promote relationship between customers and shop owner become more intimate. You can manage posts about your store, supply latest news about promotional programs, receive feedback from your customers. 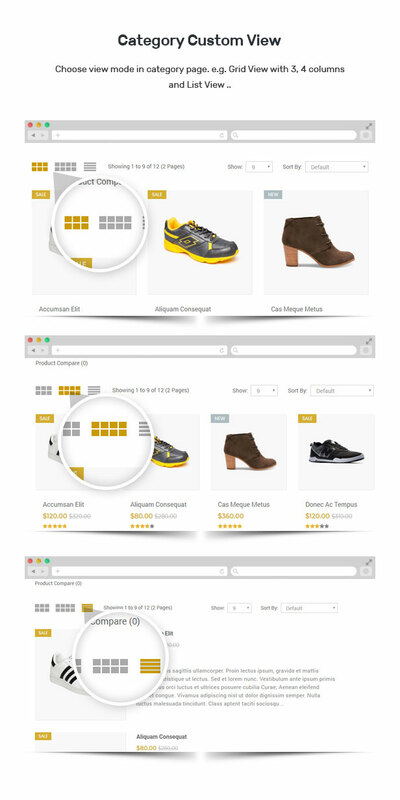 Shoes will be more elegant and friendly with customers via Product Quick View. You can quickly review a product with detail information such as price, description, colors, image and other options. Especially, Raavin allows you choose colors, fonts easily via Theme Configuration module. 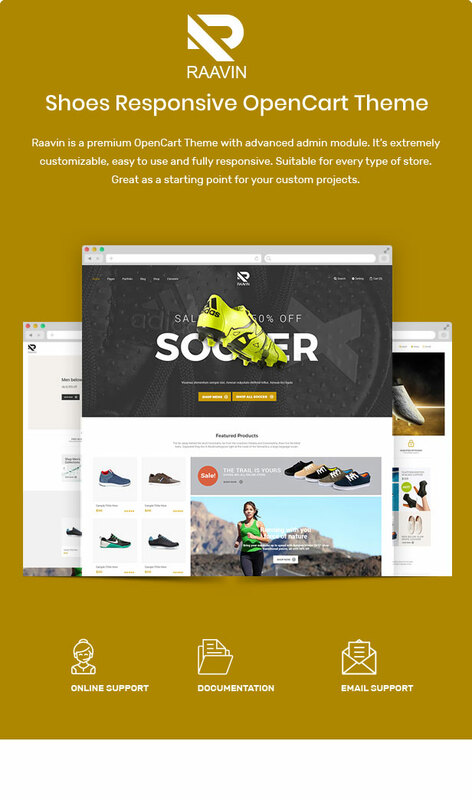 Become the first customers with this shoes Opencart theme!